I know, I know … you’re ready to hang me by my toenails before I even begin! First I ask you to let your kids run around like hooligans outside, now I’m imploring you to let them make big messes inside! Soon you’ll be asking if The Risky Kids is actually written BY kids posing as parents, with the hidden agenda of making your life as crazy as possible. But no, I assure you, it’s me writing … a real, actual parent. And this real, actual parent actually despises messes. Yes, I can be that parent that has to restrain herself from walking around behind children and guests, tidying as I go. I realize, though, that making messes is a child’s work. And by forbidding messy play I am getting in the way of not only the sheer joy of making a mess, but the developmental processes that messy play encourages. I also firmly believe that when kids don’t have an outlet for making messes, they’ll just find their own way to meet their need for messy play. Have you ever discovered a mess in your pantry, or follow the trail of quiet to see a mad scientist at work in your makeup stash? Then you know exactly what I mean! 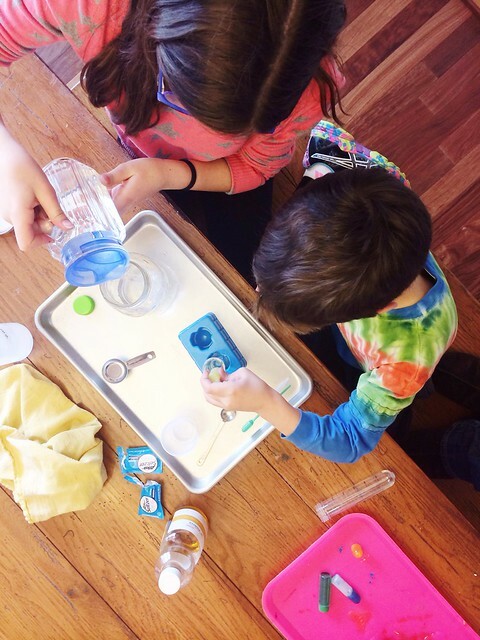 Today I’m going to focus on ways you can encourage messy play with common kitchen items. My kids are always asking if they can experiment, in which “experiment” is a code for dumping kitchen ingredients together and seeing what happens. Would I rather they make mud pies outside? Yes. But the weather and their mood doesn’t always cooperate. Would I rather they read or draw or play a game together? Yes, but they need this kind of play, too. Would I rather have a tidy kitchen and children glued to a screen? Absolutely not. I’ve found a few tips and tricks that merge the best of both worlds. The kids are happily engaged in messy play, while the mess is contained and clean-up is rather minimal. Here are some items that facilitate messy kitchen play. Keep them on hand and you can encourage experiments and magic-potion making whenever the mood strikes. Trays: Essential for keeping liquids contained. Small pitcher: Perfect for letting little hands pour their own water. Squeeze Bottles : We use these all the time – in the bathtub, for snow painting, cookie decorating, and more. Test tubes: Ours came in a Kiwi Crate (a subscription service I can’t say enough good things about). Not necessary, but they definitely make little mad scientists feel more legit. Keep old towels handy for clean up. Wear old clothes or have smocks for messy play. Set up items while children are asleep or at school. Only introduce a few items at a time. Back off! It’s not fun for them if you’re nagging or admonishing them for every spill or mishap. Finally, for some inspiration. Here are a few “experiments” to get you started. Fill an ice cube tray with water and add a drop of food coloring to each tray. Freeze. Once colored cubes are frozen, fill a clear jar with oil. Add frozen cubes and watch what happens as they melt. Once they’re done melting, add an Alka-Seltzer! If you haven’t prepped ice cubes, try filling an empty water bottle 2/3 full with oil. Fill the rest with water. Drip food coloring into the bottle, then drop in an Alka-Seltzer and watch the magic! For a truly tactile experience, try making foam dough using shaving cream and corn starch. 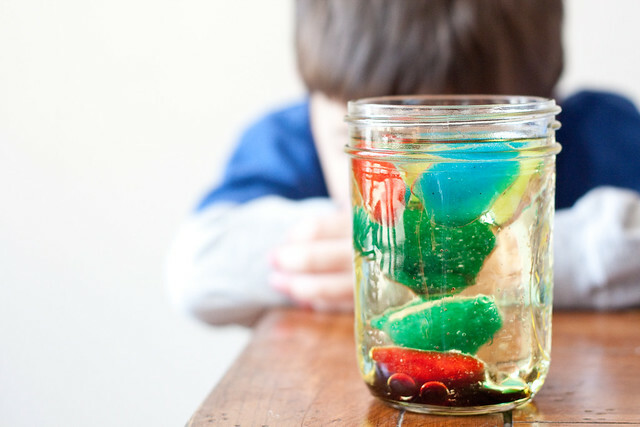 Let your child come up with their own experiments and concoctions. 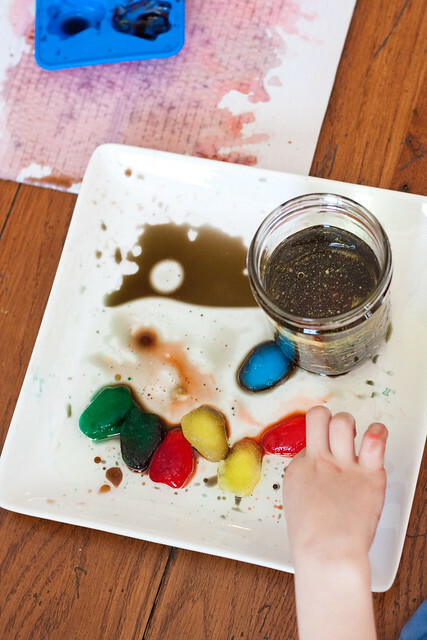 Pouring, touching, guessing, observing … these are all valuable skills that come from messy play. Have any tips, ideas, or photos of messy play in your home? We’d love to see them! Share them in the comments or post your pictures on our Facebook page! Your photos make my heart happy friend. I know I should be more of a messy mom but I freak at the thought of it. I’m not sure what my hang up is. It’s not like my place isn’t already trashed anyway. 😉 Thanks for the ideas. I think my girls will LOVE these. Thanks friend! It doesn’t come naturally to me, either. I’m sure no one could tell based on my job at The Container Store, but I’m a *teensy* bit of a neat freak. But it makes them SO happy, and we’re not long for the days when they’ll be too old to want to play with shaving cream and make mud pies. I am putting some of these on the agenda for next week. Awesome ideas!